Keep all your detailing tools close at hand while you work! 3 levels to store your favorite products, tools, and accessories. Made of engineered thermoplastic resin shelves with an aluminum reinforced top. Rolls effortessly on ball-bearing casters! The Professional Detailing Cart is a three level rolling cart designed to put all your detailing supplies within easy reach. Work more efficiently by rolling your supplies with you as you work your way around a vehicle. When you're not detailing, The Professional Detailing Cart rolls neatly out of the way into a corner of the garage. The Professional Detailing Cart is made of engineered thermoplastic resin shelves with an aluminum reinforced top. 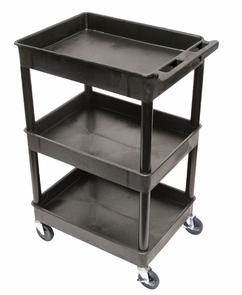 The cart is completely resistant to acids, solvents, and petroleum-based products. The plastic cart will not mar your paint if it bumps into it. The corners of each shelf are rounded. The Professional Detailing Cart features 4 inch rubber, full swivel, ball-bearing casters. The wheels roll silently. Tandem brakes prevent the cart from rolling away. Because The Professional Detailing Cart is plastic, clean up is easy. Just wipe it down with a damp cloth. Get The Professional Detailing Cart and get organized! This items is shipped by ground service only. Expedited and international shipping are not available.